Our lungs are essential to life, so taking care of them is crucial, especially when bombarded with poor food choices, poor air quality and lack of exercise. The lungs come equipped with their own self-cleaning system (the cilia, which move bad stuff out of alveoli – air sacs – into the trachea), however, this system gets clogged up when making poor lifestyle choices. Constant congestion and coughing are signs that your lungs could use some help. If you are ever feeling out of breath, have a consistent cough that won’t go away, spit up mucous or have repeated chest infections, then you may have un-diagnosed lung damage. Starting from the main cause, and healing from that perspective is your best bet in ensuring your lungs heal naturally – below are some of the top tips in healing your lungs! Eating for lung health is one of the main steps to improve the condition of your lungs. Removing highly processed foods, and mucus causing foods (wheat and animal products), as well as refined sugar is the first step. The next step is to bombard your body with food that contains life and vitality! These foods include things like watercress, apricots, citrus fruits, apples, broccoli and berries, all of which have been shown to improve the health of our lungs. Not only should you be consuming a large variety of fruit and vegetables, but you should also aim for drinking 3-4L of water, DAILY. Flushing out our system with plenty of fluids will dislodge chemicals from our cells, and help our cilia in becoming more fluid and helping them with getting rid of debris inside the lungs. Get Moving: Exercise is incredibly important to keep your lungs strong and healthy (or to repair them from damage done by asthma or smoking for example). Exercise helps loosen mucus build-up, and aids cilia in pushing mucus up and out of the lungs. When you exercise, your muscles need to work harder and thus every cell in your body uses more oxygen and produces more carbon dioxide. In order to compensate for this demand, your lungs need to work harder, and thus breathing increases from around 15 times a minute (resting state) to 40-60 times a minute (exercise state). Exercise will help increase your lung capacity too – but so will breathing exercises. Combining exercise and breathing exercises together will help ensure your lungs remain in good health. Avoiding things like cigarettes (whether smoking them, or being around the smoke itself), heavily air polluted areas, chemical products, and checking your basement for radon poisoning are essential. As we are all aware, cigarette smoke is incredibly damaging to the lungs – it damages your lungs’ natural cleaning and repair system and traps chemicals that cause cancer in the alveoli and bronchioles. It also permanently damages your alveoli, making it very hard to breathe. Not only does cigarette smoke affect the lungs, but air pollution and chemical products (like paint, cleaners, fragrances, etc.) are toxic to our body’s natural system. All of these products slowly destroy the tiny hairs (cilia) which line your respiratory tract and which naturally aid in the pushing of debris out of the lungs. Damaging this repair system means that all the dirt, germs and chemicals stay inside your lungs, putting you at risk for developing chest infections, lung cancers and chronic cough. Checking your basement for radon poisoning is also important. Radon is a naturally occurring radioactive gas produced by the breakdown of uranium in the ground. It can leak into your house through cracks in the foundation of walls, especially of those buried in the ground (like the basement). 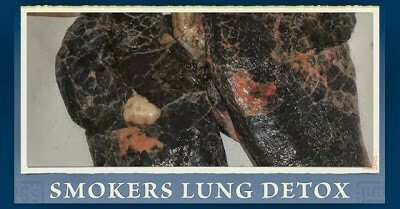 In fact, radon is the main cause of lung cancer in non-smokers, and the second leading cause of disease after smoking.